Saturday, October 14th is the time for those of us in Tampa suffering from a sweet tooth to be cured, it's National Dessert Day! If you always say “yes” to the dessert menu after a meal—this day is for you. Finding something sweet and delectable in Tampa is easy all year long. We have in our midst many serious, well-trained and inventive chefs upping the bar on sugary treats every day. So take our cue and head out for mouthwatering morsels made simple with this list just in time for your National Dessert Day adventure! A Tampa favorite is behind the doors of Dough where they make fresh house-made doughnuts, drizzled chocolates, brightly colored macarons, ice cream cones, including their doughnut ice cream cone, and much more! Treat yourself to a Magic Bar brownie or a coconut macaroon for dessert. And if you love coffee or old-time candy you are in for a nice surprise at Dough in South Tampa, they have some great selections. Gelati is something that Mr. Penguin on Platt does well. Gelati is when soft serve and Italian ice come together and make a wonderfully delicious treat! The cookie butter Italian ice with vanilla and chocolate soft serve or mango with vanilla soft serve are just a couple of your choices and a perfect way to get your sweet on for National Dessert Day! In SoHo, Chocolate Pi serves different desserts of various flavors daily. Macaroons, bonbons, house-made marshmallows, cupcakes, and ice cream creations are a few of the things to expect in this scratch dessert and craft coffee shop. Yum! Found at two locations in Carrollwood and South Tampa, Nothing Bundt Cakes has reached Tampa and the luxurious and moist Bundt is available at your fingertips! With a variety of sizes to satisfy any size party, this little shop means business when it comes to their delicious dessert. Try the red velvet bundt (there’s a mini size if you’re by yourself) because it’s so decadent and it has the perfect amount of icing. They do wedding cakes too! Inside The Hall on Franklin, Bake’n Babes has the reign on sweets! Your National Dessert Day adventure will meet treats of all varieties, like cupcakes, cookies, Crème Brulee, liege waffles, and more! To get the most out of your dessert, get the Babe Shake—it’s a milkshake made with vanilla ice cream, salted caramel, and is topped with a liege waffle. You sugar rush awaits! The Revolution Ice Cream Co. churns out different concoctions of ice cream.There are classic flavors that everyone loves but test your taste buds here for National Dessert Day with flavors such as yam, habanero, and bacon. You've got to taste it to appreciate the specialty flavors! Mini Doughnut Factory produces the smallest of doughnuts to get the biggest of smiles! These gourmet doughnuts are here to satisfy your sweet tooth whether it’s just munching on the doughnut itself, layering it inside ice cream as a doughnut sundae, or even blending some into ice cream and making a milkshake out of them. Mini Doughnut Factory is a solid spot for the perfect dessert to any meal for National Dessert Day! When science and desserts come together, DoughCones Nitrogen Ice Cream is the creator. Cold nitrogen is needed to make this creamy and sweet treat in Temple Terrace, and the cool thing (pun intended) is that you can customize what you put in it. 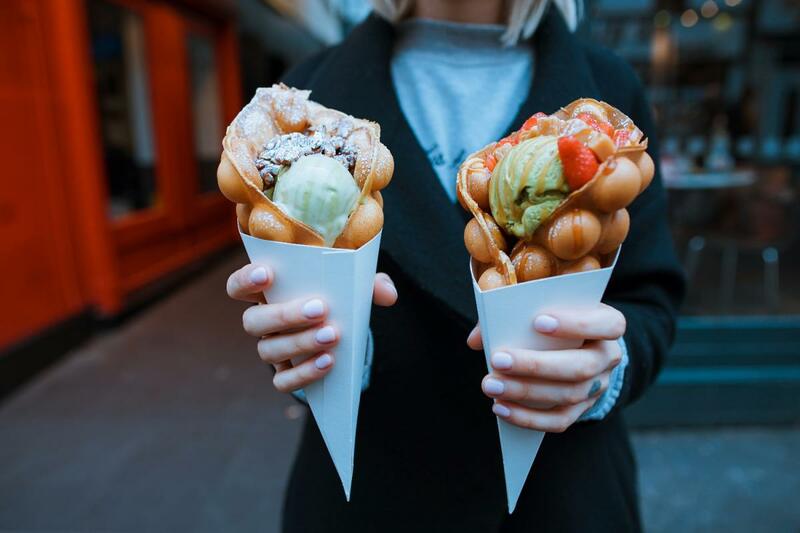 The “DoughCones” part of the name refers to their doughnut cone which is coated with cinnamon sugar or “puffle” cone which is like a waffle cone but fluffier. National Dessert Day on Saturday, October 14th is a perfect excuse to get your sweet on, especially if you're always the one to say "yes" to dessert!